Network access control system PacketFence 2.2 released ! 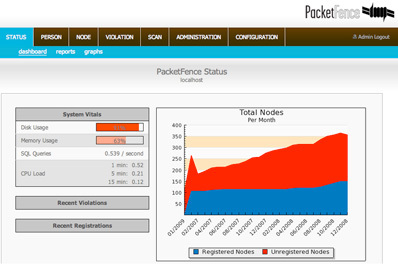 PacketFence is a free and open source network access control (NAC) system. It can be used to effectively secure networks - from small to very large heterogeneous networks. PacketFence has been deployed in production environments where thousands of users are involved - on wired and wireless networks. PacketFence is an unobtrusive solution that works with equipment from many vendors (wired or wireless) such as Cisco, Nortel, Hewlett-Packard, Enterasys, Accton/Edge-corE, 3Com, D-Link, Intel, Dell and many more. Futhermore, support for new 3Com switches (4200G, E4800G and E5500G in MAC Authentication and 802.1X) and Motorola RF Switches wireless controllers was added. Apache's configuration is automatically adjusted on startup based on system resources to avoid performance degradation on heavy workloads. And finally, new reports were added such as "Nodes per SSID" or "Connection Type".